Designed by the internationally acclaimed Scottish architect Charles Rennie Mackintosh, House for an Art Lover is a spectacular cultural attraction and tourist destination in Glasgow, Scotland which integrates beautiful stained glass windows into the building design. Charles Rennie Mackintosh (1886 - 1928), architect, designer and artist, is renowned for the astonishing modernity of his work, and believed that architecture was a supreme discipline that uniquely brought all the arts together. Mackintosh wanted to carefully balance opposites, mixing modernity with tradition, and masculinity with femininity. 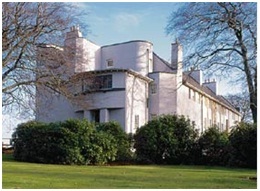 The House for an Art Lover in Bellahouston Park is a truly unique property that was built in the early 1990’s. The initial plan for the home’s interior was first conceived almost a century earlier in response to a competition announced in 1901 by a German magazine. However it was almost 100 years later when these designs would be brought to life by Graham Roxburgh and architect Professor Andy Macmillan, who saw the beauty in Mackintosh’s designs. The building itself is a dynamic construction that cleverly integrates the use of glass into its design, using both light and space to its advantage, creating a truly stunning piece of architecture. Its façade combines delicate designs on fine relief panels on the front and roof of the building with various sized windows – that together enhance the interior design. The property’s crowning glory comes in the form of its intricate detailing – its use of pattern and decorative stained glass adds to its visionary design. 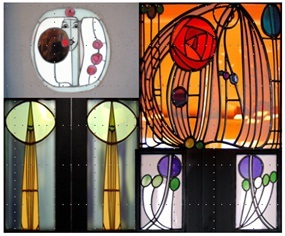 The stained glass panels can be seen in doors and windows alike – depicting the Mackintosh designs. The use of stained glass in buildings can help transform interiors – adding privacy whilst still enhancing its style – being both a practical, as well as a decorative glazing solution. With the Pilkington range of textured glass, you can add a touch of class and elegance to any area of your home – by incorporating options like frosted glass and patterned glass you can create a distinctive look. Pilkington’s range of 18 textured glass designs provide five different levels of privacy as well as toughened or laminated options for a glazing solution with increased safety and security. For more information on the glazing units available, as well as the benefits of using Pilkington’s textured glass, please visit our website.